This restaurant is a little further a field than we usually go for dinner - about 16 miles from us, but we were meeting my stepson Travis, and this is about halfway between where we live, not that we need an excuse to eat here. Although it is a little expensive, it is well worth every penny. The service is first class and the food is good, and for beer lovers they have a variety of very good beers. What is interesting is that I first ate here in 1997 and it is every bit as good today as it was back then. It is probably unfortunate that the day I chose to write my review, the dish I chose was not as good as I have previously enjoyed, having said that, it wasn't bad. We had bought two gift cards valued at $50 each from Costco at a discounted price of $79.99, so, in theory, the tip was covered. The bill for four of us for appetizer, four entrees, one beer and two sodas (yes we were being very restrained) was $80 and some change. The girl who greeted us as we entered showed some determination in trying to divert us to the 'Happy Hour' section. She seemed disappointed when we insisted on avoiding that area and asked for a booth in the dining room, which was almost empty as we were quite early. She led us to the only booth in the room where every seat was in the direct sunlight streaming through the window. We asked to sit in a more shaded booth and she looked confused and waved at the almost empty room and told us to pick our own seating. We started with the NXNW Sampler Platter - 'fried calamari, buffalo wings, fried artichoke hearts and sausage stuffed mushrooms with three delectable sauces: grain mustard, marinara, and jalapeño buttermilk'. This was very good and there was more than enough for everyone. For the main course my husband and his mother both had the Beef Tri-Tip Pizza with jalapeños, red bell peppers, mozzarella and marinara, the jalapeños were fresh, not pickled. My stepson chose Pork Chop Porterhouse with roasted red potatoes and balsamic glaze and seasonal vegetables. They were all very happy with their choices, in fact Travis repeated a number of time how great his meal was. I ordered the Cedar Plank Salmon which was served over sautéed spinach, blue cheese scalloped potatoes in a port wine demi-glas, and my main complaint was that the spinach was extremely oily. It was sautéed in garlic and oil and tasted like the garlic had not been cooked at all and the oil had not been heated sufficiently before the spinach was added, then the whole lot was poured on top of the potatoes, which were great. Unfortunately there really was too much oil and it seeped into the potatoes and the demi-glas. The salmon was slightly overcooked, or perhaps had just been kept warm too long as it was dry and the surface was a little leathery. While I was disappointed with my meal, it was not bad enough that I wouldn't go back again but I probably would avoid ordering the same dish. The menu is so good and I have had so such great food there before, I don't think that is a problem. 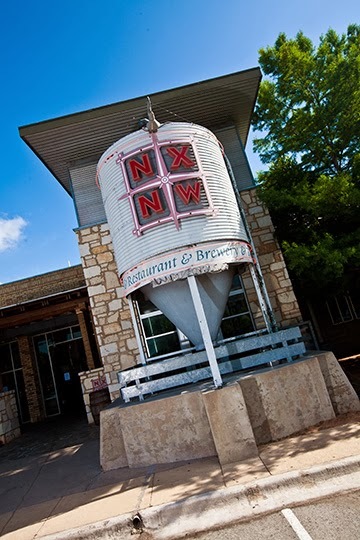 I am sure that NXNW would have responded positively had I complained and I probably should have. Unfortunately none of my photos came out, OK I forgot to put the SD card in my camera ~blush~. Maybe next time I will get photos. We have eaten in Logan's a few times, and Mildred frequently meets her granddaughter there for lunch. We are still looking for a replacement for our Friday night dinner - which, you may already know if you read my blog regularly, was always Chili's - it was our date night for years, in fact ever since the Cedar Park Chili's opened. And after Mildred moved in with us, we still continued to enjoy our Friday night dinner there with her. It was our first choice to bring guests from out of town, out of state, out of country - in fact, out of continent. All of our guests are from Europe and they all enjoyed a visit to Chili's, that is before it went to hell in a hen basket. Anyway, we are still looking for a replacement. We thought it might be Logan's. 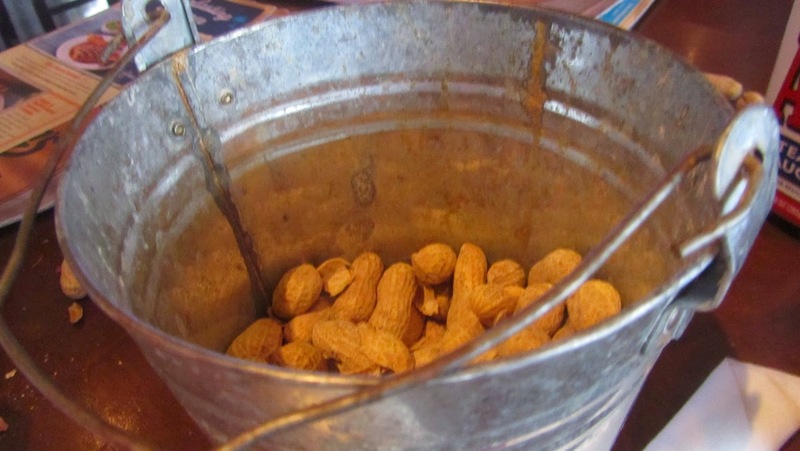 We do enjoy their free roasted peanuts on the table. Used to be you threw the shells on the floor, but now they supply an empty bucket for the shells. 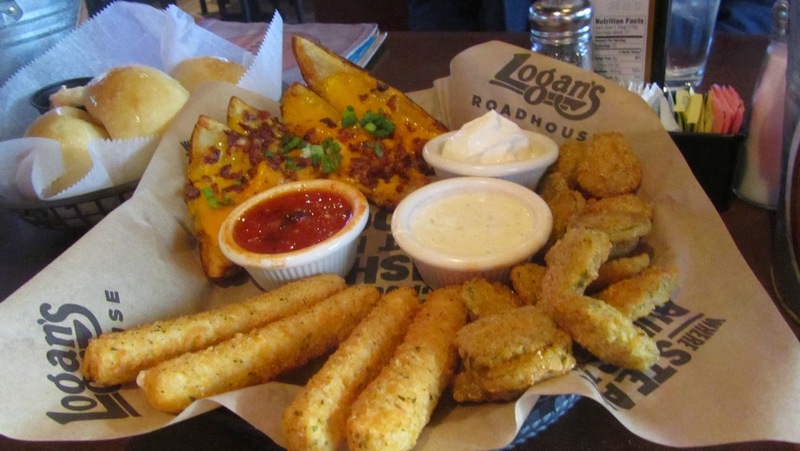 So, after another disastrous visit to Chili's on Friday, we headed for Logan's on Saturday evening. The meal started out well. Our drinks were served relatively quickly and while the freeze had definitely gone out of Larry's frozen margarita, it was a healthy serving and good. We ordered a combo appetizer, fried mozzarella cheese sticks, breaded fried pickles and potato skins. This dish arrived without any delay and was hot and delicious. It was served with three different dipping sauces. Then we waited for our main course, we waited and I had a second glass of wine. I always know when the services is really slow if I have a second glass of wine, because normally one glass will last me through appetizer and main course. What was worse was the fact that the place as almost empty, it wasn't like there was a rush on the kitchen. And to be fair, our server was very good, but we saw people who had come in after us being served before us, and still we waited. Finally the food came and it was very good. I am not sure I would say worth the wait, but definitely good, except for Larry's. 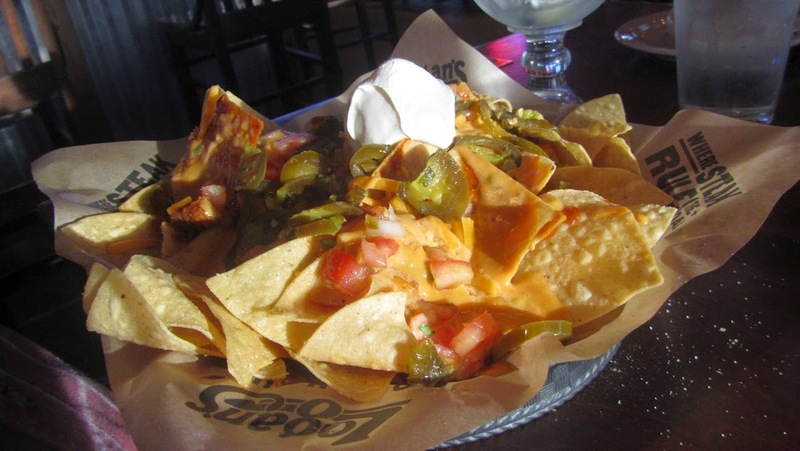 He chose to have Nachos as a main course - it was listed on the appetizer section. It was definitely big enough for a main course, but was more like bar snacks than appetizer even. There was almost no meat involved in this dish, and it was doused with liquid cheese sauce making the chips go mushy before it even got to the table. 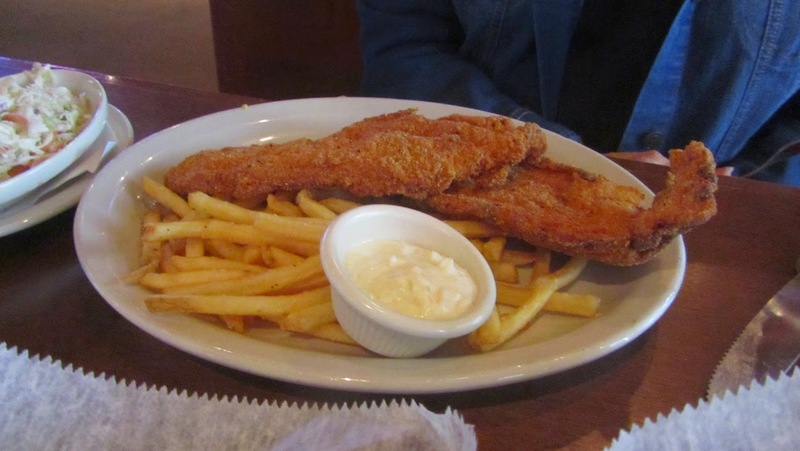 Mildred ordered Southern style fried fish with french fries, she was delighted with it, though as always there was way too much. I had mesquite grilled salmon which was on the menu with broccoli and a side salad. 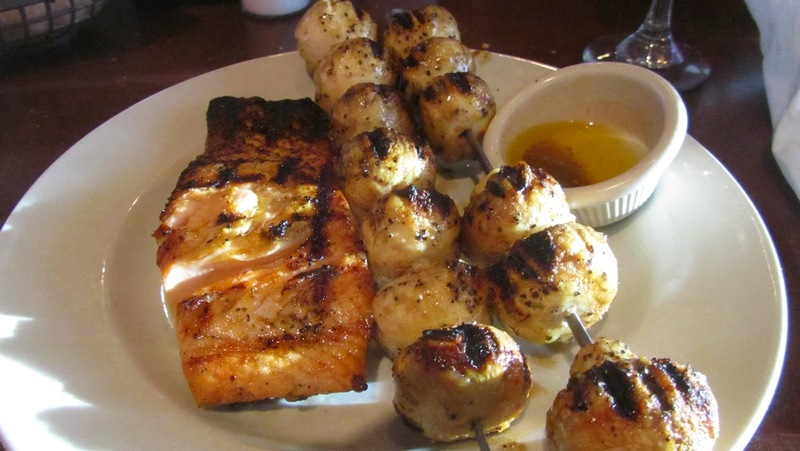 I substituted the side salad for grilled skewered mushrooms, and was asked what did I want as a side, so I said, somewhat confused, mushrooms. It arrived with no broccoli and double mushrooms. Luckily I absolutely love mushrooms and they were amazing as was the fish. Again, enough for two, but that meant I had lunch the following day, and it was equally good warmed up. The verdict is out on the service. The price was way more than we would expect to pay in Chili's, but that is no longer a good comparison because the last time we went there my poor mother in law didn't receive her food it until after we had almost finished and she only ordered soup, worst was it was cold - so cheap doesn't really come into it. You get what you pay for. We will go back to Logan's I am sure, but I don't count it as a contender for our Friday night unwinding.